Autumn is my favorite season. It is also my ultimate muse. I always feel that during this time I ooze with creativity and ideas just keep on popping. And one way to translate these ideas is through a photo shoot. I don’t shoot for a living, I only shoot to release the accumulated stress I have being a salaryman. I posted a casting call in Model Mayhem and was fortunate to get positive replies from models in Japan, among them is Artemis Bare. Artemis Bare has an impressive portfolio. I contacted and informed her that I normally shoot with friends (Russel and Ming) and that we depend on natural light instead of using external flash. She was completely fine with the set-up. Autumn leaves and foliage played an important part during the shoot. It was a perfect backdrop while she donned a vintage-princess-like dress. Hair and make-up were styled by Niki. 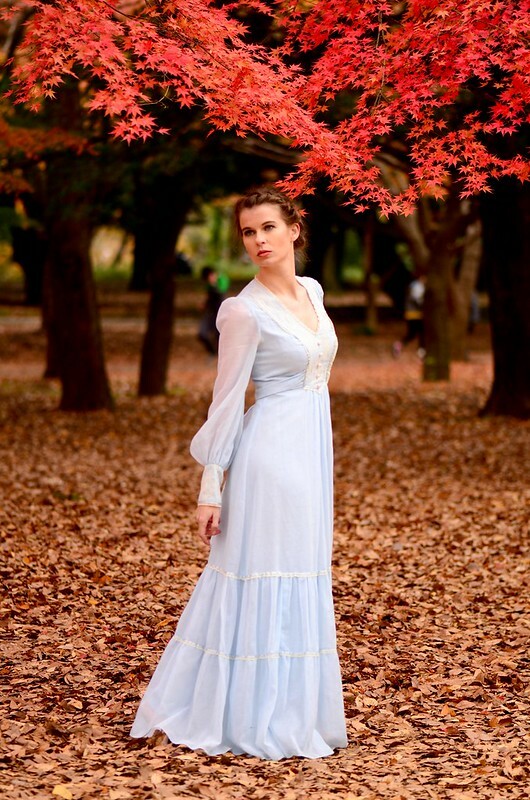 Yoyogi Park was the perfect location in realizing our concept. The weather was a bit cold though, luckily she was all covered. She was very professional despite having only an-hour sleep prior to the shoot, no complaints or whatsoever. Yes, she even volunteered to climb up a tree wearing a long gown. It was an enjoyable 2-3 hour fun shoot. I always see to it that everyone involved in the shoot had a great time. Should there be another chance to shoot her, I would do it in a heartbeat. In the meantime, I will wait for the coming autumn to be inspired once again, or to patiently wait for the birth of a new concept. I love the look on her face. :) Not too maangas but not too soft either. Your photos are stunning and what beautiful models and dresses. I LOVE Autumn too, can't wait!!! Autumn is my favorite season as well. The transition tot he sleep of winter is so filled with color, fragrances, and explosions of flavor. The carpet of leaves is gorgeous. Are those fallen gingo leaves? Thanks Annie. Not sure about the gingo leaves though. I loved the swirly one. lovely photographs John, so love the one where she was up a tree. it's good to have found a passion other than work, since it indeed is very stress relieving.